Myrtle Beach National has three premier Myrtle Beach golf courses and King’s North might be considered the most memorable. King’s North was redesigned in 1996 by non-other than the “KING” himself, Arnold Palmer. Since its beginning King’s North has garnered many awards and continues to do so today. Some of these awards are “America’s 100 Greatest Public Courses” – 2004 and Golf Digest’s “Places to Play” has awarded it 4.5 STARS ever since. Golf for Women Magazine ranked it “Top 100 Courses in America” 2000-2004. 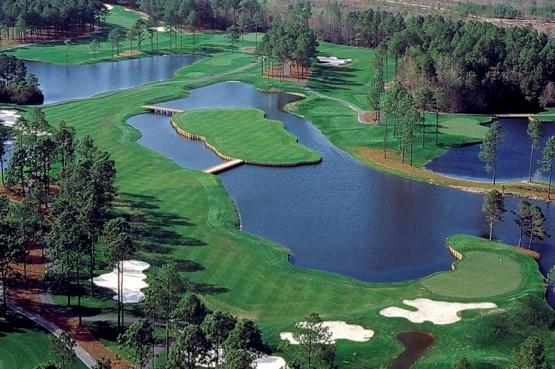 King’s North features some of the most breathtaking views and unique golf course characteristics you will encounter on your Myrtle Beach golf excursion. The par- 5 sixth hole is named “the Gambler” features an island fairway giving golfers an option to play it safe, or taking a risk, which would give them an opportunity to go for the green in two shots. The 12th hole is a very challenging par-3 where you will encounter water to the right of the green and if you pull the ball to the left the “SC” bunkers will capture your ball, leaving a tricky up and down. The 18th par-4 finishing hole, offers a definite challenge as you wind navigate your way through 40 bunkers. King’s North is the perfect Myrtle Beach golf course to include in your next Myrtle Beach golf package. After your round of golf you will certainly want to take advantage of the beautiful Myrtle Beach weather and take a stroll on the white sandy beaches. When the sun goes down, the lights go on, and the Myrtle Beach nightlife come alive. Myrtle Beach dining is some of the best anywhere and the world class Myrtle Beach theatres such as Alabama Theatre and Palace Theatre offer a wide variety of entertainment for everyone. Your South Carolina vacation would not be complete without visiting many of the South Carolina state parks and South Carolina historical sites. It is time to make plans to visit Myrtle Beach, South Carolina and book your Myrtle Beach golf package! This is an amazing course you must book when comming to play. Great layout and well maintained. The greens were a little beat up but it’s still early in the year with cold weather.